An epidemic has swept some of Penn Manor’s students: 12:01 disease. Call of Duty features many lifelike war scenes. Common symptoms of this terrible affliction? Coming down with a sudden illness at 12:01 a.m. – just the time when a new video game comes out. In most cases, the student will be advised to stay home from school the next day – and, in some severe cases, the student in question won’t be seen for the next week. What could possibly be the cause of this terrible disease? Call of Duty: Black Ops, that’s what. The newest in the Call of Duty (or COD, as it’s commonly called by the players) series from the developer, Treyarch. The preceding game, Call of Duty: Modern Warfare 2, broke all records for the first 24 hours of its release. According to MaximumPC, Modern Warfare 2 sold 4.7 million units in the first 24 hours in stores, the biggest release in video games ever – stealing the title from Grand Theft Auto IV. And those numbers are just in the U.S.- raking in $310 million just in that first day. Black Ops is another record breaking game. A statement from Activision said that Call of Duty: Black Ops sold 5.6 million units and $360 million in that first day. Many stores that sell video games had midnight release parties, where the line started early in the night and stretched out of the stores. Penn Manor is home to students who were some of those lined up late on Monday night at video game retailers like Game Stop at the Park City mall in Lancaster. Call of Duty is a First Person Shooter – or FPS – where players go through various historical scenarios. Call of Duty has been commended for its attention to historical accuracy and twisting plot. The only part of Black Ops that isn’t historically accurate is you. Another part of the COD experience is a game called Zombies – or Nazi Zombies, as it is known in its previous title. It is a survival game where two people playing alone or up to four people online try to defend an area from the raging horde of zombies shuffling their way toward the building. The goal is survival, but all players must fall in the end to the walking dead as more and more zombies come at them, faster and faster. Players get points for zombie kills, and can spend the points on better weapons and barricades on the doors and windows. But Black Ops puts a new twist on the playable characters. *SPOILER ALERT* Before, the player was a nameless soldier in a lonely shack, but now the action gets a whole lot weirder. The playable characters now include John F. Kennedy, Fidel Castro, Richard Nixon, and Robert McNamara, who are fighting zombies at the Pentagon. As the players kill zombies, the characters will spew sound bites from famous interviews and speeches. “That is so cool!” exclaimed one student. Several changes have been made concerning game play in Black Ops – like the elimination of Deathstreaks and the dreaded Nuke – whenever a player gets 25 kills in a row in Modern Warfare 2, they can get the use of a tactical missile to wreak havoc upon their enemies. Another perk for kill streaks is a remote controlled car, which players can pilot near enemies and pull a trigger, detonating the car. Call of Duty: Black Ops is set in the Cold War era, and spans many different locales. Other, smaller changes include the moving of shotguns from a secondary weapon to a primary weapon. Another new area is Combat Training, where new players can practice their skills against computer controlled enemies in a format similar to online gameplay, to ease newbies into the online experience. Before, new players would be forced to run headlong into online games, where they would be shellacked by the older, more experienced players. “I’m so excited for this game. I would get it, but I just got the new Fable, and I’ll be too busy playing it for the next month to play COD,” said another student. Nerds and geeks alike will rejoice, for Black Ops also contains a hidden Easter egg that not all players could spot. Following the instructions in the main menu found here: Wired.com, players can turn the main menu into an old text based computer. Type in the command “DOA”, and the screen turns into a top down zombie shooter. Type in “Zork”, and the computer turns into the text based adventure game Zork, a classic choose your own adventure game. You’ll also receive the achievement “Eaten by a Grue”, which will only make sense after you’ve played the game. Call of Duty: Black Ops has made a splash in the pool of Penn Manor’s gamers, but the best is yet to come. 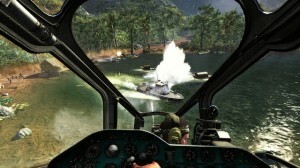 Modern Warfare 3 is slated to arrive in 2011, and who knows what that will bring. I also liked reading this article because i never did understand why so many people are obsessed with this game. I think you did a good job adding a sense of humor in with this fun article. hi my name is zachary gambler, i am journalist from Hempfield. I thought you were very informative and wrote this article well. I have played COD once or twice, but I learned a lot from this article. I did not realize it was so popular that people line up for it the way they used to when the harry potter novels were at large. I look forward to playing this new game. Again great article.